While I love my physical books as much as I love my eBooks, there are times when I forget my book at home, or don’t expect to have the time to read, and in those cases, it’s nice to have a book or two available on my smart phone. Especially when I want to read a heavier book like War and Peace, I can download it on my phone and not carry a heavy book around. 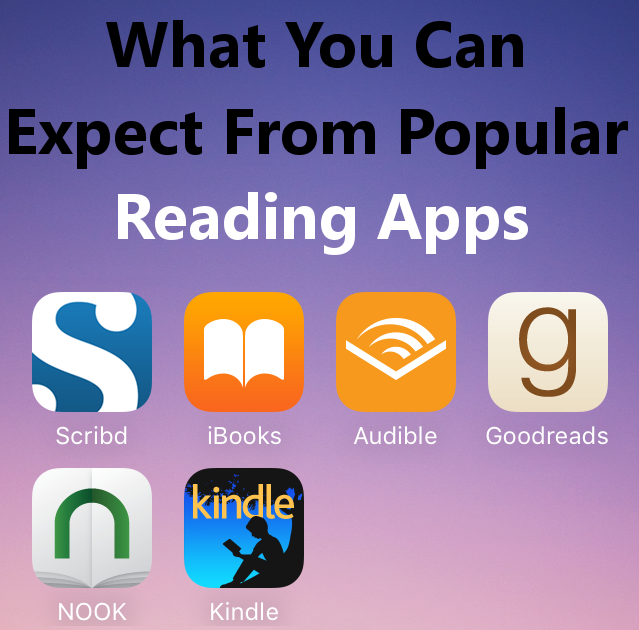 Lately, I’ve been curious about what sort of reading and book-related apps are out there, and today I found several I could download for free. While I was looking through them, I decided to record my findings and share them here so other people can determine which apps would be best for them without having to download them all through trial and error. It is a free download, but then if you want a month-long free trail, you have to sign up for a renewing subscription of $8.99 a month for access. You can choose three eBooks to read and one audio book per month, so in a way, you’re paying $8.99 for four books, one of which you can only listen too. It’s not a bad deal if you’re serious about reading. I’m sure that you could sign up for the free trail with renewing subscription and then just cancel on the last day before the free trail is up and read the three free books and listen to the one audio book in that time. Some benefits are that you can download the books so you can read them offline, and that there’s also sheet music and documents available (although I’m not sure how that fits into the “three eBooks, one audio book” per month plan. Maybe they're included with access. -On a separate note, the app has a nice color scheme and is clean and easy to navigate- blue and white palette. The book page has a clear rating system, page count, how long of an expected read, and a good summary. -I’m reading the preview to see what the in-app reading lay out is like. It took about a minute to download a 1200 page sample. Swipe right to left to turn pages, nice spacing, no awkwardly cut off words or spacing issues. This makes sense, since it’s expecting you to be doing all your reading in the app, so it’s well formatted. If you can afford to pay $8.99/mo for 3 eBooks and 1 audio book, and you like reading on your smartphone screen, then yes. It's a high quality app and looks like it delivers a high-quality experience. Something you should now before you open the app is that if you don’t immediately connect your amazon account and press “Try App” in the top right corner of the screen, you’ll get 10 free audiobook excerpts, all best sellers. Here are the ones that came with my app, I imagine that they’re all the same, and you can see that they all average about 40 minutes or so. Even if you have an amazon account you can sign in with easily, I always recommend trying something new first, before you commit with your email address. This is a good way to see if audio books are for you or not if you’re uncertain, like I was. So you can’t buy the audio books in the app, you have to go online to audible.com. So after the 30-day free trial, audible is 14.95 per month as it says in small print at the bottom. So to use this app, you have to go online to audible.com and purchase the books there and refresh the app for them to show up. If you are a big fan of audiobooks and can afford 14.95/mo, then maybe this is a good deal for you. Since I am just a casual audiobook listener, I chose not to sign up. I still used the app to listen to a few samples of random books, but otherwise, it’s useless to me. I might re-install it and listen to more of those free 40 minute excerpts though. If you’re a fan of audiobooks and can afford $14.95/mo, then yes, I do recommend it. Especially if you already have an Amazon account, that makes it just a bit easier. Just in case you’re not familiar, Goodreads has a website that functions in the same way as this app. Essentially, Goodreads is a website that helps you find what books to read next. You give them information about what kind of books you like (usually by rating books you’ve read), and it suggests books you might also like. You can also read other’s reviews of books your considering reading, and if your friends use Goodreads, you can also use it as a form of social media, sharing what books you’ve read or are interested reading, and your friends can share their book choices with you. It’s a nice app, and I like it, but it’s the same as the online website I find. It all comes down to a preference of if you like using your phone or your computer more. If you love to read, then you definitely need to have an account and use either the computer or the app, if not both. It’s a great resource to have. The only thing that could make it better for me would be to actually be able to read the ebooks in the app. But since you can’t access the books on the website version other, it wouldn’t make a lot of sense. It’s just a resource for planning and managing, not actually reading the books. Still, as I said before, I think it’s necessary for every reader to have an account. If you have an iPhone, then you already have the iBooks app, whether you like it or not. It’s one of the pack of apps that comes pre-installed with your iPhone that can’t be deleted. Since I’ve been reluctant to try eBooks, I’ve ignored it along with a lot of other pre-set apps, but now I gave it a try. The iBooks app is designed the same way the App store and iTunes Store are, so it’s a familiar and easy to navigate design. The design isn’t the only thing these apps have in common. The iBooks app is basically the iTunes store, but for books instead of music and movies. You can sample them, buy them, and then have them on your device. And it’s convenient because it all gets automatically charged to your Apple ID, which it automatically signs you in to, so you don’t have log in at all or enter any payment information. I’m not a fan of the page turning animation, but that aA button on top has a lot of good options, one of them being the scroll feature. It’s better than the cramped page and page turn animation, but it makes me a little motion sick, especially if I would be reading on the bus or train. But I’m glad that there are so many options to make my reading experience more comfortable. If you have an iPhone, then you already have it, but still, the answer is “yes”. So far, it’s one of the best options for reading both eBooks AND audiobooks and then just buy then straight away with a pre-connected account. However, there aren’t as many free options as there are in the other apps mentioned. -This app is supposed to accompany a nook, but functions just fine if you don’t have one. You can explore the app first, instead of signing in straight away, and I like having that option. The app has a “Discovery” section that updates daily containing quite a few samples of two-minute reads. You can edit what sort of things you want to see by genre. This is available without even signing in. Since I have a nook, I did sign in after looking around and found that I had 4 free downloads. I’m not sure if everyone starts with those four, or if they were left over from my nook and got transferred over once I logged in. Either way, I downloaded one and it only took about 2 seconds, which is extremely fast for my Wi-Fi, and it seems to be the full book. Like audible, you can’t purchase eBooks in the app, but you can download samples of anything. You purchase the eBooks on your nook or on Barnes and Noble.com, and then it’ll show up in the app. That way, if your nook runs out of charge or you forget to take it with you, you can still continue reading the story on your phone. The only problem that I found with it is that the reader was very clunky and needed to be better formatted. Luckily, they also have the options to adjust the text, so it can be reasoned with and improved. I think this happens because the samples are meant to be read on a nook, not the smaller screen of a smart phone. But the problem is fixed easily enough. If you have a nook, I’d say, yes, get it. It’s a well-designed and aesthetically pleasing app. It also gives you a lot of free samples, but is otherwise unnecessary. You can organize your nook books on it, but you can also just use your nook just as well without it. Like the nook, this app is made to accompany the kindle reader, so you have to sign in with an Amazon account first. But once you do, the app gives you unlimited access to every book available for one week. There isn’t even a pressure to sign up to pay. -this app seems simpler, its mainly black color scheme. You can synch books with your kindle, but if you don’t have one like me, that section is blank. I downloaded a full story and again, even though I’m on crappy Wi-Fi, the book downloaded in seconds. Since simply downloading the app gives you a week of unlimited access, the answer is yes. All you have to do is open the app and sign in with your Amazon account. From there, it’s up to you if you want to continue using it. I can see how it would be useful with a kindle too. I hope these little informal reviews help you with your e-reading, whether it be on a smart phone or tablet.